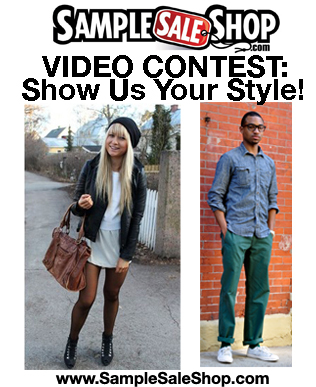 VIDEO CONTEST: We are launching our street style video contest TODAY! TODAY, son! Contest: Make a video showing us your street style, and let us know where you’re from or where you’re reppin’. Keep it under 3 minutes. It doesn’t have to be a fancy short film – You can even make it on your video phone. Prizes – a prize pack featuring a gift certificate, a t-shirt, and more! Get the full 411 at our CONTEST page. PS – Member Give-Away: If you sign up at SampleSaleShop.com, you are automatically eligible to win some free swag! This entry was posted in accessories, Hers, His, SampleSaleShop.com Contests, sporting gear, unisex and tagged contest, contests, cool watches, give-away, giveaway, look book, lookbook, lookbook.nu, lrg, LRG x Casio G-shock, members, nd, nike, nike watch, Nike womens, Sample Sale Shop, SampleSaleShop.com, sport watch, street style, streetwear, video contests, vimeo, watch, You Tube, youtube. Bookmark the permalink.